Create your iDirectDial account by filling out the simple sign up form and let us know the main phone number you will be placing your International calls from. Once registered you are able to add child accounts like your home, mobile, or business phones. Enter your friend's name and numbers and we'll give you a unique local number for each contact. You’ll receive a text message with your friends name and new local number that you can add to your phones contacts — no apps or new dialers to download. 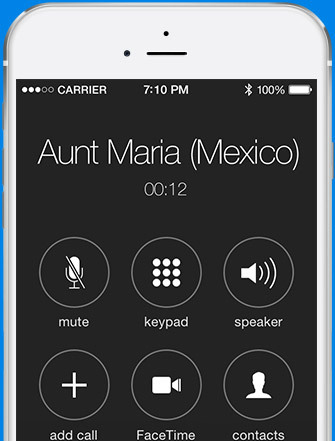 Now calling friends and family overseas is as easy as calling across the street. Simply open your phones contacts, tap on the person you’d like to call —That’s it! The iDirectDial system automatically connects you to the associated international phone number. iDirectDial offers a unique international calling service unlike any other that can be used from any phone. It doesn't matter if you have a smartphone or landline you can still make super cheap phone calls to your friends and family all over the world without the hassle of dialing access numbers and lengthy International phone numbers. Our technology allows you to simplify your life while saving time and money by placing International phone calls far cheaper than before and as simply as tapping on the name you wish to reach directly from your phones contacts. Dialing numbers to reach your friends and family globally is a thing of the past! No apps to download — your phone is ready to go! © Vox Plus, LLC. All Rights Reserved.